Architectural photography blog by Las Vegas-based architectural photographer Michael Tessler. Topics include architecture, design, and the photography of both. Photographs and stories from recent projects are also found here. I am honored to announce the opening of my first gallery exhibition at Savidan Gallery located at Faciliteq’s showroom in downtown Las Vegas, NV. I’m really excited about this opportunity to share some of my work with the larger design community in Las Vegas. 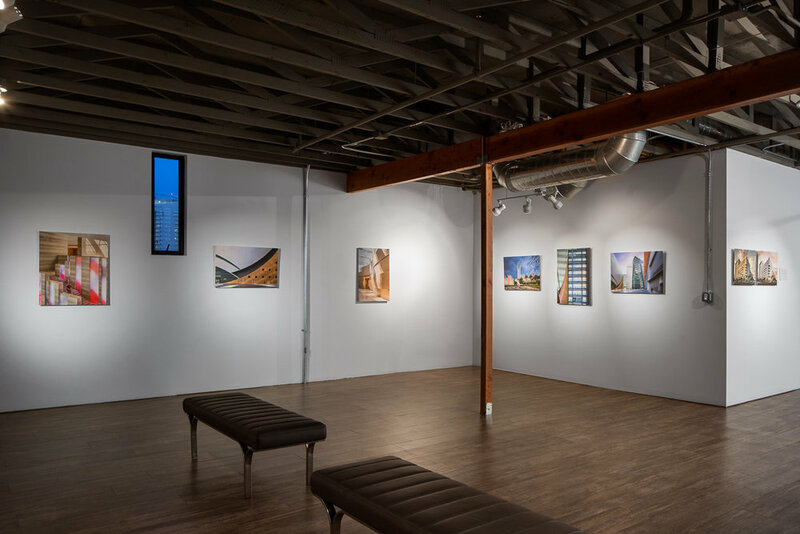 My exhibition features photographs of the architecture and design of downtown Las Vegas, but it’s not what you might think. I don’t have photographs of the casinos or Fremont Street on display. Instead, these are photographs that show Las Vegas as a living, working city. For example, featured among my photographs are the Las Vegas City Hall, the World Market Center, the Smith Center, and several residential and commercial buildings. These are the structures of government, culture, life, and work that make Las Vegas a real city beyond its facade of casinos and entertainment. This work is part of my ongoing project to capture the environment and life of downtown Las Vegas. At the opening reception last night, I said I wanted to thank the architects and designers who continue to build Las Vegas because without them, none of my work would be possible. Not only do architects and designers create the subject matter I love to photograph, they also serve as my inspiration. I tried to make my photographs fit right in with the scenery outside. If you’re in Las Vegas, stop by Faciliteq’s showroom on 3rd Street. They have a beautiful gallery, and I’m proud and honored to be showing my work in it. I am an architectural photographer based in Las Vegas, NV. I specialize in photographing large commercial and civic projects as well as smaller commercial spaces and residential architecture and interiors. Wow, it’s been a long time since I’ve posted a new blog article, but that is not because I haven’t had anything going on! In fact, I’ve been extremely busy with a lot of different projects. I’ve also been working very hard to connect with architects and designers and others who are interested in professional architectural photography. I have also been working on my Instagram account. Over the past few weeks, I have been making a great effort to increase my activity and presence on Instagram. I am trying to make a new post to my account each week. I’m going to continue to post my finished architectural photographs on Instagram, but I also plan to do some behind the scenes posts. I’m working on a video right now that will show some of the magic of post-production in Photoshop. You can learn a little more about this building--parking structure in downtown Las Vegas, NV--in my post. My Instagram account is @michaeltessler, and I added an link to my profile here on my website in the upper right corner of each page. I am finding that Instagram is a great way for me to connect with lots of different people who have an interest in architecture and design. I hope to see you out there! Michael Tessler is a Las Vegas-based architectural and interior design photographer. I am available for projects and assignments in Las Vegas, throughout the country, and globally. Projects include hotels, restaurants, offices, shopping centers, and other commercial spaces, public works, private residences like houses, apartments, and condominiums, and all projects that involve the photography of architecture and/or design. All text and images are copyright © 2016-2019 Michael Tessler. All Rights Reserved.